Amanda Nedham’s pieces at Le Gallery’s current exhibition “Bloodletting,” are such stark highlights that the other works shown pale into abrupt obscurity. Upon entrance to the show, the viewer is greeted by her first piece, And the Valley was tumbling with Lilies and Dogs. Fashioned with the assistance of Nedham’s pal Sean Kosonic, a professional mascot-maker, the artist was able to create a sculptural installation in the form of what she describes as a creepy “self-cannibalizing hybrid.” Her plush mutant is made up in part by one of our nation’s own animal idols, the Canada goose, which is unfortunately conjoined to a potentially malicious mutt. The piece is mounted on a worn out metal pedestal from which a plug snakes out onto the floor. The exhibition card reads that the base is actually from an outdated piece of exercise equipment. I regret that I didn’t get the chance to watch her creation shake around ridiculously while I pondered the absurd sickness of her fuzzy idea. The addition of mechanized spasms would have accentuated the welcome similarities to the macabre fuzzy toys frequently used by French artist Annette Messager. Past this work Katie Pretti’s massive oil stick paintings entice the viewer with a frenzied mess of whirling lines and lovely mismatched colours, but I will shyly admit that the first thing that drew me to the pieces was the ornately gilded wooden frames. Sarah Clifford-Roshotte then presents us with a series of collages, reminiscent of the magazine torn portraits from her summer exhibition No Poetry. Aside from a bit of folding and maybe a staple or two, the work fails to push the limits of any technical boundaries. Deeper into the exhibition is Nedham’s second sculpture in the show A Hunger Artist II a title borrowed from Franz Kafka. In this work, she practices her mascot making skills to create the body of a dog, which hovers in space within a glass display box. The young artist’s almost accidentally persistent undercurrent of humour is most evident when you are privileged to watch as someone unsuspectingly inserts their hand past the folds of silk-screened fabric to experience over 600 hand sculpted polymer clay “teeth” in the body of this little headless beast. Nedham’s talent as a traditional artist is the final treat revealed in A Hunger Artist, the companion drawing poised behind the abominably interactive work with the same name. The creative obsession behind the compulsively crafted teeth is channeled here into carving thousands of precision strokes with a 3H mechanical pencil into watercolour paper. In it perfectly drawn barnacle-like deformations of teeth expand like rabid foam from a German Shepherd’s mouth. Amidst a coffee fueled effusion of erudition Nedham explains that this bizarre pairing of natural elements is a sort of whimsical evolutionary projection of a particular species growing to accommodate the needs of its services to humans. It is also one of her first pieces in a series of explorations into the perverse nature of the human pursuit of power. 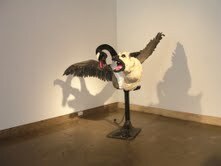 Bloodletting is only on at Le Gallery until October 3, 2010. 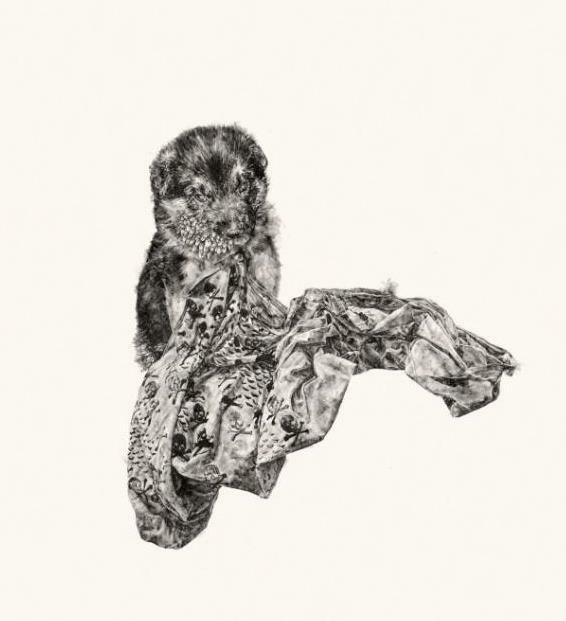 If you miss her work at this show, Amanda Nedham will showing a series of pencil drawings entitled Like Milk and Blood at Le Gallery in December. I thought Nedham’s work is also exceptionally strong. I am excited to see where the sculptural work will go.